As they did last year, Amimon had a three-room suite at the Hilton--a large living/dining room, with bedrooms at either end. And, as they did last year, Amimon showed a number of systems working simultaneously, free from interference. I've been one of Amimon's skeptics, curious about how they're able to send a 1080i/720p signal in 20 MHz of bandwidth, and eventually a 1080p/60 signal in 40 MHz of bandwidth. Amimon claims that their approach delivers uncompressed high-definition video, and wrote a now-very-long-in-the-tooth white paper on compressed versus uncompressed. I think that they made some very valid points in their white paper, but A) a 26-month old white paper in a market where companies are already failing begs to be updated, and B) consumers really don't give a damn--they have no religion about compression, but simply want a cost-effective solution. Which, by golly, Amimon seems to be well on the path to providing. Of the five systems (Amimon, Radiospire, Pulse~LINK, SiBEAM, and Tzero) I wrote about during CES 2008, and the one that I couldn't write about (Sigma Designs), I felt that Amimon had the best demo in terms of distance--the only demo that one could reasonably call multi-room. I also felt that they had the worst quality, by a longshot. What a difference a year makes. The progress Amimon has made with their existing chipset and continued software development is huge--so huge that Sony is currently shipping a $799 transmit/receive pair under the Bravia Wireless Link brand. This is not "currently shipping" as in, let's recycle an old press release. This is shipping as in, I was in the employee store at Sony San Jose last week and was shocked to see it on sale. The store had a demo of a Blu-ray movie playing across the show floor at a distance of about 25 feet. I'm not Joe Kane, but I was very satisfied with the quality--so much so that for a fleeting moment, I thought about buying the set, until I remembered that I didn't actually need it. Amimon is also present in devices from at least a half-dozen manufacturers, including in select high-end Sony, Mitsubishi, and Sharp televisions currently for sale in Japan. Amimon's next generation silicon promises to be even better. However, I'm still left with a few niggling questions. First and foremost, I'm concerned about what happens to performance once the 5 GHz band fills up, just as the 2.4 GHz band has. When it comes to interference and bit/packet error rates, video is nowhere near as forgiving as data is; consumers (and retailers) won't tolerate a device that either doesn't work out of the box, or gets hinky after a year or two of use. Second, with the industry's stampede towards higher refresh rates, I'm concerned whether Amimon will be able to scale with the increased demands of 120/240 MHz (usually countries with 60 Hz mains, almost all of whom are/were NTSC) or 100/200 MHz (usually countries with 50 Hz mains, almost all of whom are/were PAL/SECAM) sinks, as well as sources putting out wider and wider bitstreams (e.g., Deep Color). Finally, I'm just not sure that Amimon knows who they want to be. Are they an in-room solution? Are they a multi-room solution? Are they a whole-home solution? But, for now, for users who don't mind paying a hefty premium over an HDMI cable, they're the only game in town. I have to confess that I hadn't heard of Axar, prior to bumping into a buddy who's working for them. Axar is a division of ProVision Communications, a British company who've been working on wireless video since 2001--which may make them the longest-surviving company in the space. 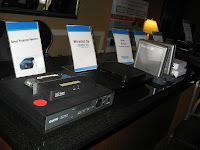 Axar's solution differs from the other systems I saw in that in its current testing stage, it uses component connectivity, rather than HDMI. I see this as a mixed blessing. As a new entrant to the market, they'll need to come up to speed on physical issues (e.g., HDMI 1.3c & 2.0) and content protection issues (e.g., HDCP 2.0, DCP LLC doing away with ART). But, not having to worry about those issues right now allows them to focus on the development and delivery of their system. Their demo suffered from some judder issues (which should be fixed in software even as I type this) as well as pretty severe latency challenges, but I think Axar's worth keeping an eye on, based on the price points they shared with me (which I unfortunately can't disclose here). One final hurdle they're working on is the issue of tying up a tuner in a remote room. Axar's initial target is European service providers; the application is sharing of living-room set-top box content to other rooms in the house. In my own home, I don't see a ton of applicability for pausing a stream here in the living room, then resuming it in the bedroom. Admittedly, this is a feature that's been desired by lots of folks, so maybe I'm in the minority. But, if Axar could work with the carriers to take existing dual-tuner boxes and allow one of those streams to go to their transmitter while the other stream is being viewed in the living room, they'll have a huge winner on their hands. Carriers will do just about anything to avoid provisioning another full-price box in a second or third room in the home. Axar...exploiting the analog hole, in a good way. If you caught my post on my favorites of CES 2009, you'll recall that I was extremely impressed with the demo from Celeno, who're taking a little different approach to this market than others. Celeno is building a Wi-Fi chipset for the transmit (source) side, and is capable of being received by any off-the-shelf draft 802.11n chipset with sufficient radio & antenna chains. They're also using a compression partner to make the signal bandwidth more manageable; as I noted in my earlier post, their demo at CES was in partnership with Cavium Networks (nee W&W Communications), and looked rock-solid. I would guess that based on the physical state of the demo, Celeno is probably a year behind Amimon and SiBEAM, whom I'd consider the leaders at this point. But, keep an eye on them--they count Cisco as an investor, which makes them worth watching above and beyond how great their demo was. Monster is working with Sigma Designs to bring a unique system to market. The Monster/Sigma approach combines coaxial cable and wireless to deliver a backbone and access solution--coaxial for whole-home connectivity, wireless for in-room access connectivity. Since this system is based on WiMedia ultra-wideband, the partners had to face the reality that their wireless solution is at best an in-room technology--meaning, either scrap the idea of whole-home video networking, or come up with an innovative solution. They chose the latter. The good news is that the wireless link will co-exist nicely with Certified Wireless USB devices in radio range, owing to its WiMedia compliance. Further good news is that WiMedia's 528 MHz channels give the partners a lot of bandwidth with which to play, on both the wired and wireless sides. However, the solution is not without challenges. While WiMedia has a relatively massive amount of bandwidth, its transmit power is pretty much the noise floor, making in-room connectivity extremely variable, and multi-room connectivity all but impossible over wireless. Also, while the coax solution operates in the 3.1-4.8 GHz spectrum (avoiding programming, DOCSIS, HomePNA, MoCA, et.al. ), the higher attenuation present at those frequencies can be an impediment, particularly in older homes with poor quality coax and/or splitters. And, like the others, the list price (in this case, $999 for a pair) of the system reinforces my belief that 2009 isn't yet the year for wireless high-def. But, like the others, the Monster/Sigma solution has its own unique benefits, and could fit the bill for quite a few folks, particularly in North America. I was fortunate enough to visit both SiBEAM's demo suite at Harrah's, as well as the WirelessHD interoperability suite at the LVCC. Similar to my feelings about Amimon, I've been very skeptical of SiBEAM's claims. And, similar to what happened in my meeting with Amimon, the scales fell from my eyes. Maybe skeptical isn't the right word to describe what I'd been thinking about SiBEAM. "Disbelief" might be more appropriate. Over the last 2.5 years, I've heard a lot of claims in this market, most of which have turned out to be malarkey. And, based on what I've heard from "those who oughta know" (i.e., engineers who are way smarter than me), there's no way that the SiBEAM guys were gonna be able to do all the stuff they wanted to do by using the 60 GHz band. The demos I saw in the SiBEAM suite had three different sources sending HD content to a sink. Not only did they work, they looked great, had negligible latency, and only broke up when I covered the transmit antennas by pressing my hand against them--and even then, recovery was nearly instantaneous. Similarly, the demos I saw in the interoperability suite also looked great, with products from LG, Toshiba, Panasonic, and a host of others all humming along simultaneously. After last year's demos in the Panasonic booth, which were akin to something you might see in Madame Tussaud's Wax Museum (look over there, beyond that velvet theater rope, where no one's allowed to stand...yes, over there...that's the demo...don't exhale), I found this year's demos to be refreshingly robust. Refreshingly high quality. And yes, refreshingly real. Do I believe that SiBEAM is going to hit the magic price point for Christmas 2009? No, of course not--I'd have to rescind my earlier prediction, and I'm not prepared to do that. 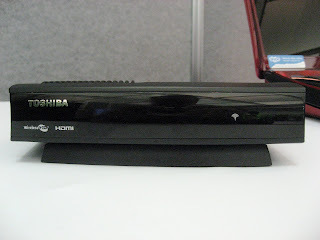 But, do I believe that Wireless HD will begin to show up as a feature in higher-end televisions, just as WHDI has? Yes, absolutely. The horse race throughout 2009 and beyond is going to be interesting; I look forward to continuing to cover it.